Freddie Mercury was a man of many talents and many different sides. The songs he wrote for and with Queen filled stadiums around the globe and have rightly gone down in history, but he also embarked on a solo career that took him from the clubs of Munich and New York to the great opera houses of the world. He was the ultimate showman, but he kept his private life away from the prying eyes of the media; a larger than life rock star who loved disco, classical music and ballet. He was a restless spirit, a true chameleon who reveled in his own contradictions. All the different sides of this iconic musician can be found on Freddie Mercury: Messenger Of The Gods – The Singles. Fittingly released on Mercury Records for the world outside North America, and on Hollywood Records in North America, this box set brings together all 13 of Freddie’s solo singles on individually coloured vinyl. From his debut solo single I Can Hear Music, released under the name Larry Lurex, through the dance floor-influenced solo anthems of the 80s and up to his collaborations with legendary Spanish opera singer Montserrat Caballé including the timeless Barcelona, this is a journey through the career of a unique talent. Born Farrokh Bulsara on the East African island of Zanzibar on September 5, 1946, the rechristened Freddie Mercury was already a star in his own mind by the time he formed Queen with Brian May and Roger Taylor in 1970. Where his band mates had studied astrophysics, dentistry and electronics at college, Freddie majored in stardom. His first solo single actually emerged a week before Queen’s own debut 7”. Released in 1973 and credited to Larry Lurex in a nod to the fashionably flamboyant noms de rock of the glam era, the Beach Boys cover I Can Hear Music and its B-side, Goin’ Back, were recorded as a favour towards a musical project by Trident Studios’ house engineer Robin Geoffrey Cable, in 1972. As Queen’s career rocketed towards the heavens, Freddie poured his energies into the band. It would be more than a decade before he released his second solo single, the pulsating, electronic Love Kills. Originally released in 1984, Love Kills was a collaboration with famed Italian disco producer Giorgio Moroder for the soundtrack to Moroder’s update of the groundbreaking 1927 silent movie Metropolis. A Top 10 UK hit, it found Freddie moving away from Queen’s traditional sound, paving the way for what he would do next. Released in 1985, Freddie’s debut solo album, Mr Bad Guy, fully explored the music he had fallen in love with in the dance clubs of Munich and New York. The four hit singles released from that album – I Was Born To Love You, Made In Heaven, Living On My Own and Love Me Like There’s No Tomorrow, all of which are included in the Messenger Of The Gods box set – crackled with playfully hedonistic energy, but they also hid a more serious side to Freddie. Here was a man who craved the good times but wanted something deeper as well. Within two years, he had abandoned the sound of the clubs for the music of the opera house – though not before releasing both the epic single Time, the theme to the lavish stage musical of the same name produced by Dave Clark, and his outrageous (and strangely revealing) Top 5 cover of The Platters’ 1965 hit, The Great Pretender. In 1987, he dived headlong into the world of opera and classical music with the towering single, Barcelona. A duet with legendary Spanish soprano Montserrat Caballé, an idol of Freddie’s, it came about after the opera star asked him to write a song about her home town. Barcelona remains one of the most momentous hit singles not just of Freddie’s career but in pop history. Not only did it lead to an album of collaborations between these two huge talents, but the title track was also chosen as the official anthem of the 1992 Olympics. That song, together with the two other singles taken from the album, The Golden Boy and How Can I Go On, are all included as part of Messenger Of The Gods with their original B-sides. In October 1988 Freddie and Montserrat were invited by the King and Queen of Spain to perform Barcelona on the steps of Barcelona’s National Palace of Montjuic at the open air La Nit festival which was staged to mark the arrival of the Olympic Flag from Seoul. But sadly, Freddie would not live to see the fruits of his collaboration with Montserrat Caballé showcased at the Barcelona Olympics. He passed away on November 24, 1991, just seven months before the Games took place. The grand opening ceremony was a fitting tribute to a man who thrived on spectacle. 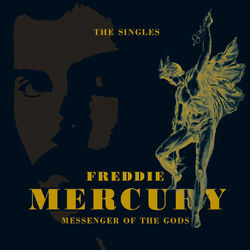 Messenger Of The Gods is completed by two posthumous singles, In My Defence and Living On My Own (No More Brothers Radio Mix), the latter of which became Freddie’s first solo number 1 and was the biggest selling European single of the year in 1993. Had he lived, it is anyone’s guess where this most restless and protean of singer’s muses would have taken him. But Messenger Of The Gods – The Singles is a towering legacy, a collection of songs which will never lose their stature of classics and will live on forever. September 5, 2010 saw The Mercury Phoenix Trust, the HIV AIDS charity set up in Freddie’s name by the remaining members of Queen and manager Jim Beach, launch ‘Freddie For A Day’, a major annual initiative designed to celebrate Freddie’s life each year on his birthday and to support the on-going work of the Trust. Taking it one stage further, Freddie’s 70th birthday, September 5, 2016, will be marked on Sunday September 4th with a major celebration in Montreux, the Swiss town he so loved. The event is in aid of The Mercury Phoenix Trust, and will see fans and friends gather at Montreux Casino to remember Freddie and raise a toast to him at midnight. Official tribute band, the Queen Extravaganza will fly into Montreux especially to perform for the evening marking their first performance in Freddie’s Swiss home town. 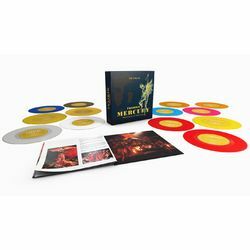 Freddie Mercury: Messenger Of The Gods – The Singles is released by Mercury/Universal on September 2 as a box set featuring 13 x 7” singles on coloured vinyl with a booklet featuring photos, some of which are previously unpublished, and text. It will be released in North America through Hollywood Records. Freddie Mercury: Messenger Of The Gods – The Singles will also be available on 2CD with a 20-page booklet and as a digital album.